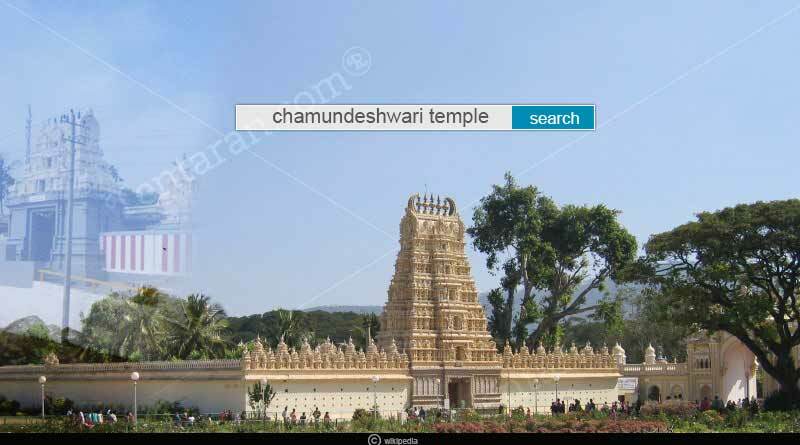 The Chamundeshwari Temple is 13kms from the city of Mysore in the state of Karnataka, India which is dedicated to Goddess Chamundeshwari, a form of Shakti. It is one of the most popular Durga temples in India. Goddess Chamundeshwari is known as Naada Devathe by the people of Karnataka. It is believed that she protects the people of the state from evil. This temple has over 1,000 years of history. Initially, there was a small shrine of the goddess and over the centuries it has turned into a big temple. She is the slayer of Mahishasura, the buffalo-headed monster and also killed demons, Chanda and Munda. The temple came into significance after the Mysore Maharajas, the Wodeyars, got the power in 1399 A.D., who were great devotees of Devi Chamundeshwari. Chamundeshwari Devi is the tutelary deity of Maharajas of Mysuru and is also the presiding deity of Mysuru. There is a tower at the entrance of the temple which has a small image of Lord Ganesha. The doorway is silver-plated and is covered with images of Goddess in different forms. The silver-plated temple doorway has images of the Goddess in various forms. On either side of the doorway, there are images of door-keepers and after few steps; there are footprints of the Goddess. The idol of the Goddess wears a garland of a skull and is decorated every day and is worshipped by various priests. Coconuts, fruits and, flowers are offered to the idols. There is a huge statue of Nandi (bull) on the 700th step away, in front of a small Shiva temple. This Nandi is 16 feet tall and is one of the largest in India. Navaratri is the most important festival here. Mysore Dasara festival is celebrated as the state festival. During this time, the Goddess is decorated in 9 different avatars to portray nine different forms of Durga. On the 7th day of Navaratri, jewels donated by Maharajas are brought from the District Treasury of Mysore and offered to the Goddess Chamundi. The temple is surrounded by some other temples dedicated to various Hindu Gods and Goddesses. Morning time is best to visit this temple. From the month of October to December, the view is mesmerizing and the air is refreshing. So, what are you waiting for? Plan a trip to Mysore and don’t forget to visit this amazing place. If you need more information, send us an email at contact@tentaran.com or just WhatsApp at +91-8860698002. For more articles like ‘Chamundeshwari Temple’ do follow us on Facebook, Twitter, and Instagram.